Reducing hexavalent chromium exposure with cleanable filter media - Sentry Air Systems, Inc.
Sentry Air Systems is excited to publish our Industrial Hygiene Report on the Control of Welding Fume Particulates using Cleanable Filter Media as it relates to Hexavalent Chromium. Hexavalent chromium [Cr(VI)] is highly regulated by the Occupational Safety and Health Administration (OSHA) due to the fact that Cr(VI) fume is a known human carcinogen. Cr(VI) fume is easily generated during welding applications, particularly on stainless steel. Because of stringent exposure limits to hex chrome fume in the workplace, we sought to test the efficiency of our Sentry Air cleanable Micro-Pleat Series filter media against Cr(VI) fume during a MIG welding application. The entire test procedure and findings are linked at the end of this blog post. Samples from the test were couriered to a third party analytical lab. Their results are noted in the below tables. *For this test, the micro-pleat series filter was placed inside of a Sentry Air Model 450 Welding Fume Extractor. Efficiency was determined by comparing the inlet and outlet samples taken on the Sentry Air welding fume extractor. Results were based upon the testing conditions that were present, actual results may vary. 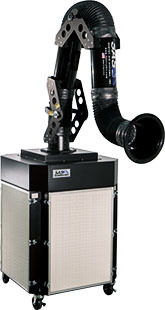 *For this test, the Model 300 Welding Fume Extractor was equipped with a carbon pre-filter and HEPA main filter. Efficiency was determined by comparing the inlet and outlet samples taken on the Sentry Air welding fume extractor. Results were based upon the testing conditions that were present, actual results may vary. The fundamental difference between this test and our most recent test is the filter media that was used. The 2007 test used a carbon pre-filter with HEPA main filter; both non-cleanable filter media. Conversely, the most recent test used our micro-pleat series cleanable filter media. — The effective application of Sentry Air’s cleanable and non-cleanable filter media – in accordance to the aforementioned equipment and test conditions – for the welding of chromium containing alloys may reduce operator exposure to Cr(IV) fume to an acceptable sub-action level range. The results presented in both hex chrome tests are based upon testing conditions that were present. Actual results may vary. It is always advised to use multiple engineering safety controls. We invite you to review the below links for more information regarding our hexavalent chromium tests and related articles. 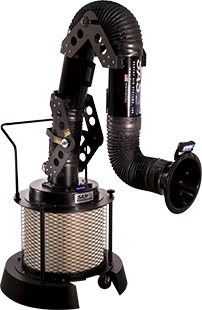 For more information about controlling hexavalent chromium fume or to receive a free quote on our welding fume extractors give Sentry Air a call at 800.799.4609, email sales@sentryair.com, visit our website or fill out the feedback form below.